Consultants in Print provides a comprehensive service and advice for the preparation of tender documents. Another service CIP provides is the preparation of documents for organisations to obtain tenders for the procurement of services to ensure they receive the best value at the most competitive rates. We work with CPOs, CFOs and other senior executives to help align their procurement and supply chain strategy considering both the strategic direction and operational needs of the organisation. We pride ourselves on being innovative and flexible helping clients to deliver significant and sustainable results quickly. The objective of CIP is to create documents, from a thorough study of its client’s requirements, to solicit tenders from suitable suppliers so that our clients can be provided with products and services of the highest obtainable standard and the best value for money with guaranteed cost savings over an agreed term. Our approach seeks to fully understand and analyse the Current Operating Model (COM) and compare it to an accurate assessment of the needs of the organisation. From this we will develop a specification and pricing document for a tender process to identify a suitable supplier which will provide a more efficient and effective Target Operating Model (TOM) for your organisation. CIP estimates that over a three year contract between 70% – 80% of the original ‘basket’ of items quoted for will either change by revised specification or quantity. We will put a strategy in place that ensures ongoing, transparent and sustainable cost savings are achieved. 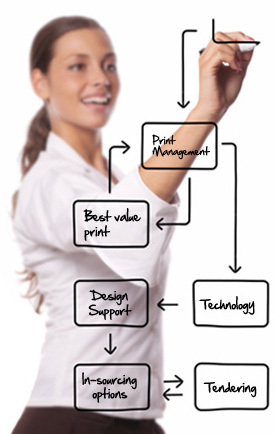 We will conduct an assessment of the current requirements and estimated level of opportunity by analysing the effectiveness of, for example, any in-house reprographics facility, design capabilities and outsourced print purchases. Following the collation and analysis of data, we will submit a report on our recommendations which we will discuss with you and revise as necessary to ensure it fully corresponds with your requirements and objectives. a). Preambles. These would specify the conditions under which the tender is to be prepared and submitted, and include the tender process timescale. It would further specify the conditions under which the contract is to be fulfilled and include the methods of scoring and evaluating the submissions. b). Specification. This section would specify the quality standards of the products and services to be provided. c). Questions. This section would solicit responses from tenderers to satisfy us regarding their suitability, cost saving methodology and capabilities to effectively and efficiently fulfil the contract. The tender documents would then be submitted for approval to you prior to distribution, and revised if necessary to ensure they fully correspond with your requirements and objectives. Potential tenderers would then be approached to confirm their willingness to submit a tender upon the stated terms and within the timescale. The tender documents would then be sent to the agreed companies. They would then be required to acknowledge receipt of the documents and again confirm their ability to submit a tender. Any queries arising from the tender documents would be responded to and the responses sent to all tenderers (if applicable) to ensure they are all provided with the same information. In coordination with your organisation, the tenders would be evaluated and marked, and then a report sent to you detailing CIP’s recommendations including short, medium and long terms gains and opportunities for specialist negotiation. Finally, we ensure the appointed supplier(s) is delivering in accordance with the agreed contract and service levels, and that you are realising the savings and benefits.